Nelson Mandela is so much more than a man. He is a phenomenon, a force of nature, one whose true brilliance we can&apos;t possibly see without the benefit of hindsight. He used his 95 years on this planet in a way that the world deemed impossible until his existence. He changed the world in a manner reserved for a very selected few—people like Gandhi, Mother Theresa, Dr. Martin Luther King. However, he was also a revolutionary in the spirit of Nat Turner, Assata Shakur and Malcolm X. As every man who lives to reflect on their past eventually does, he came to regret some of the decisions he made when he was younger. For him, that he made while fighting for the freedom and rights of all South Africans. Ultimately, he is remembered for his compassion, his forgiveness, and his humanity, alongside his willingness to stand up and fight in the best way he knew how, for the rights of the oppressed. This full, complete life he led made him the greatest leader in generations. As the son of activist parents, I learned about Nelson Mandela early—it was like he was part of our family. While the news called him a "terrorist," we called him a freedom fighter. By the time I was in high school I rocked a Keith Haring "Free South Africa" button on my Nelson Mandela book bag and began going to rallies, and on graduation day I put a sticker on the top of my cap that said "Abolish Apartheid! "Just like Barack Obama said, the movement to end apartheid and free Nelson Mandela was the first movement that politicized me. As the son of activist parents, I learned about Nelson Mandela early—it was like he was part of our family. While the news called him a "terrorist," we called him a freedom fighter. As a Black man, I related to the South African&apos;s struggle against apartheid in many ways. However, as an American there was no way I could truly say I understood the experience. As bad as we had it in America, Blacks in South Africa had it worse. These were the conditions under which Nelson Mandela transformed himself into one of the world&apos;s most powerful voices. In 1961, he was jailed for daring to stand up to one of the world&apos;s most brazenly racist police states. And then, along with others like Bishop Desmond Tutu and Steve Biko, convinced millions that apartheid was wrong—while locked up doing hard time for 27 years. Finally, after years of pressure from humanitarians around the world, Mandela was released from prison in 1990. He went on to become the president of South Africa, abolish apartheid from the law, win the Noble Peace Prize and change the world&apos;s view of what a revolutionary could accomplish. In 1999, while I was recording my Reflection Eternal album with Hi Tek, Dave Chappelle dropped by the studio. This was early in our careers, and we were recording everything, trying to capture the candid moments. We decided to get drops from famous people, but we didn&apos;t know enough, so Dave began to impersonate people. While the drops from Lennox Lewis and Gil Scot-Heron, rest in peace, were real, it was Dave doing everyone else from Bill Clinton to Nelson Mandela. Dave&apos;s Mandela impersonation wasn&apos;t spot on. None of them were. They were great because they were funny in premise. 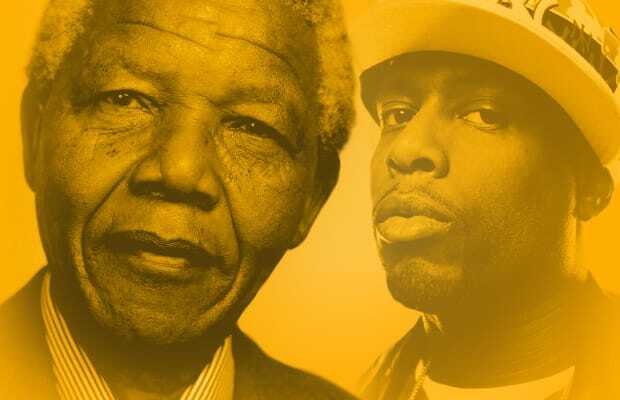 The struggle against apartheid was something that we were all raised to respect and participate in, but the idea of Nelson Mandela "chilling out" in South Africa, listening to Talib Kweli and Hi Tek, was hilarious to us. Til this day, at least once a month, I get asked about how I got Nelson Mandela to do that. Folks are shocked when I tell them it was Dave Chappelle. It&apos;s a beautiful feeling every time though, because even though it&apos;s funny, it was done in loving tribute. We will always love Madiba. RELATED: Interview: Talib Kweli Talks About Being a "Prisoner of Conscious"